Lee Hurst calls in at The Apex with his new show ‘Mucking About’ on Friday 13 April. Having earned his stripes over twenty years ago as a circuit comic and one of the best TV warm-up men in the business, Lee was quickly promoted to being a regular face on comedy panel shows including ‘They Think It’s All Over’ and ‘Have I Got News For You’, where he became a household name. Lee appeared in the first five series' of the sporting quiz ‘They Think It’s All Over’, before concentrating on running his own comedy club. Coming out of semi-retirement to “keep his hand in” while the club was being rebuilt, his tours were so well received that he's now regularly out on the road. Currently, Lee enjoys performing live to audiences all over the country, and has a reputation for being a master of his craft, who can artfully control any crowd. His combined quick wit, sharp observation and easy manner make an evening in Lee’s company a fun night out. Lee’s style of comedy is funny stories, quality gags and side-splitting observations. There are no gimmicks or over-arching narrative journeys or messages. This is one man, a mic and his mind. The show is simple. The content is hilarious. The audience turn up. Everyone laughs. Everyone goes home happy. Easy. Lee Hurst is ‘Mucking About at The Apex on Friday 13 April at 8pm. 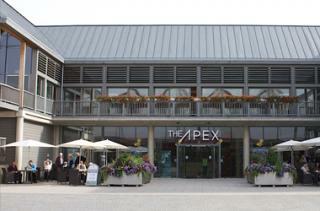 Tickets are £17.50, ring the box office on 01284 758000 or see the website - www.theapex.co.uk for details.